Back in 1987 the King of Rock ’n’ Roll’s recorded legacy lay in shambles. A decade of haphazard and occasionally offensive posthumous anthologies had been piled atop a previous decade of cheapie compilations. Ernst Jorgensen changed all that. Already a student of Elvisiana by the time he was tasked by RCA with restoring the King’s musical heritage in the late ’80s, Jorgensen began serving up a treasure trove of reissues, compilations and re-contextualizations. The newest is the 'On Stage: Legacy Edition', pairing two LPs that document the King’s return to the concert stage in Las Vegas in 1969 and 1970. Jon Cummings from the popculture website Popdose recently interviewed Ernst Jorgensen about his Elvis catalogue restoration work. Back in 1987 the King of Rock ’n’ Roll’s recorded legacy lay in shambles. A decade of haphazard (and occasionally offensive) posthumous anthologies had been piled atop a previous decade of cheapie compilations, most designed to milk the last farthing out of rock’s most prodigious (if maddeningly inconsistent) catalog. As the CD era blossomed, Presley-curious music shoppers of the mid-’80s were left to rummage through the LP racks in a soul-crushing, and often fruitless, search for an album that might provide both a clutch of good songs and something approaching value for money. Nowadays, Elvis’ catalog is perhaps the most lovingly preserved and intelligently presented in all of rock – from the exhaustive, decade-specific box sets of the early ’90s to the genre-specific, single-disc comps that emerged later that decade, and on to more recent sets like Elvis 30 #1 Hits and Elvis 2nd To None. In the last year Sony/BMG has celebrated a milestone birthday with the Jorgensen-compiled box Elvis 75 – Good Rockin’ Tonight (right) – a just-about-perfect rendering of the catalog for a new generation of listeners. 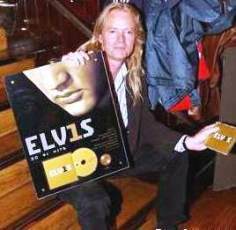 Jorgensen organized BMG’s Follow That Dream label to release Elvis esoterica (soundboard recordings, outtakes, etc.) in small quantities for the obsessives — superseding not only the bootleggers, but also RCA’s annoying history of padding its commercial reissues with superfluous redundancies. More important, he has worked with the Sony Legacy label to create pristine, well-annotated reissues of Elvis’ most historically important albums. Jon Cummings: Explain the thinking behind combining the In Person and On Stage albums for the new release. Was the goal to create a more complete historical document? 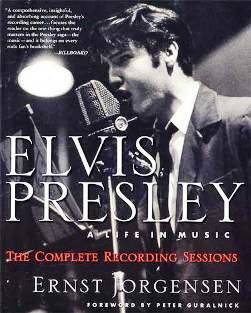 Ernst J: We did the Legacy edition of the Memphis recording sessions [from the winter of 1969] last year, and we decided to follow it with the live material in order to give listeners a better impression of the scope of Elvis’ "comeback." These two albums tell two different stories about Elvis’ re-emergence as a live performer. In Person is very much like the Comeback Special — it’s like the shows that Elvis used to do in the ’50s, full of songs from that era — while On Stage is Elvis doing covers of songs by other people, many of which were contemporary at the time. 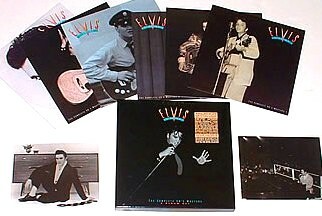 Both the albums are important because they show the transition that was taking place at that point in time, when Elvis was getting comfortable with his new ambitions as a live performer. With On Stage, in particular, he took that new confidence and started to show the world that, not only through his own hits but also by his choice of other material, he was alive and well in the middle of the contemporary scene. Jon: I found it interesting that you chose to use the On Stage title rather than In Person, and that you placed On Stage on Disc One of the set, considering that it came second chronologically. I guess I had always considered In Person the more important set, historically speaking, because it had represented Elvis’ initial return to live performance. Ernst J: This is not an album for collectors, per se — it obviously wants to be a historical document, but it’s also a question of commerciality. We focus on On Stage because it’s not a concert souvenir; it was a recording aimed for the commercial market. 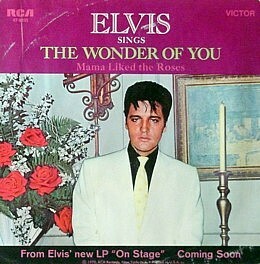 It had a Top 10 single in "The Wonder of You" – a song that was also a Number One hit in England, and which made On Stage the more successful album on an international level. It’s also the more commercial album, broadly speaking, with songs like "See See Rider" and "Polk Salad Annie" that were new to Elvis at the time, but became staples of his concert repertoire. 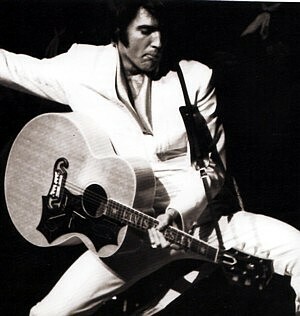 In that way, On Stage pointed forward in Elvis’ career, whereas In Person was mostly looking backward. 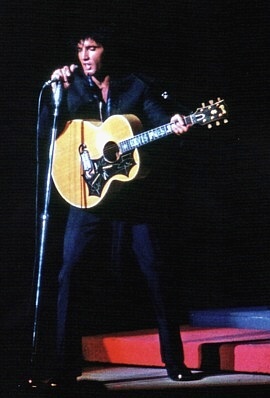 To put it another way, In Person had been primarily a live reminder of the Comeback Special, while On Stage is the first chapter of the new Elvis. There’s also the odd release history of the In Person album, which came out first as one-half of the two-record set From Memphis to Vegas/From Vegas to Memphis, and only later [after On Stage became a Top 10 album] was re-released by itself. In any case, they are equals in my mind as historical documents, and when you put them together as we’ve done you get a very complete look at Elvis’ live comeback. 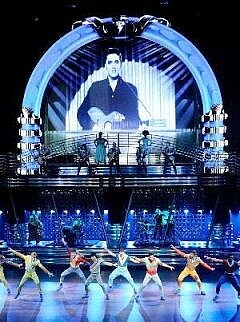 There were so many live Elvis albums between the Comeback Special and his death. Where do these recordings fit into that canon, in terms of quality and historical importance? Ernst J: If we’re talking about commercial history, the later concerts may in fact be more prominent. The sellout at Madison Square Garden, for four straight nights [in the summer of 1972], was certainly a very big deal at the time, and the Aloha from Hawaii television special was the first of its kind and was seen by more people than anything he had ever done. But from my point of view, for the way it marks the evolution of Elvis as an artist – the transition from that endless string of movies that it’s now politically correct to hate, to the Memphis recordings and then to the live comeback — this album is more important. I have this theory, which people might be able to shoot down, that in Elvis’ own mind and in terms of achieving his own goals he never felt more on top of his career than in the summer of 1970 when On Stage came out. Now he had full control of his persona and the music he was performing, he had his own band and he could sing gospel next to R&B next to rock. He liked having a full orchestra behind him — and it’s not a small thing that he was excited about the surprisingly high quality of the recordings that he could make on that stage in Vegas. At that moment, people were still surprised that anything of quality could emerge from Elvis. Ernst J: You know, the booklet we created for this package has a very important point. If you think back to where important rock acts were performing in 1969, it was the Fillmore East, or Winterland, or Woodstock. And it’s important to remember that it was held against Elvis that, after all those years away from live performance, he decided to stage his comeback in Vegas rather than at one of those places. In addition to that, in the context of history we have tended to oversimplify the various stages of Elvis’ career, and to a lot of people "Elvis in Vegas" represents Elvis in decline, fat and out of breath and on his way out. The booklet, like the music, portrays that it’s wrong to think of this period in that way. Elvis certainly looked and sounded great in the That’s the Way It Is film, which documents this same time period. Ernst J: Precisely. He’s lean, he sounds incredible, he’s wearing black karate outfits and looking as good as he ever did throughout his career. This comeback period was really a rejuvenation – much more like a new beginning than the beginning of the end. That’s one of the benefits for me of working on historic recordings like these – you can change people’s perception of what was going on at the time of the music’s original release. 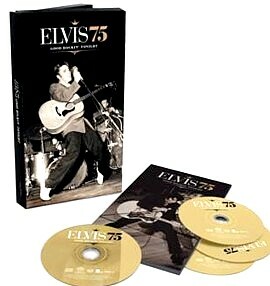 How much sonic tinkering goes into creating these new editions of Elvis’ albums, and specifically the live albums? Ernst J: We re-transfer the music from the original album masters. We’ve learned which tape machines work best for re-transferring recordings from various time periods, which pre-amps to use, and all those sorts of technical issues. We work as a little group, and all the other people in that room are a lot smarter about this stuff than I am. Basically, what we’re trying to do is to get the sound as close to what Elvis and his engineers heard when they sat in a room listening to the playback in 1969. That’s interesting to me, particularly in contrast with the Beatles’ remasters that were released to such celebration last fall. Part of the excitement came not only with the fact that the new CDs sounded far better than Capitol’s initial CD issues, but that the wholesale remastering made the tracks sound better than they ever had before, in any format. No similar desires with the Elvis material? Ernst J: You know, you could remix this material and make it sound more modern, but that’s not the aim of this Legacy series. Our goal is to get as close to the original sound as possible. At the end of the day, people are going to sit in their living rooms and play these CDs with a particular set of expectations, and we’ll have failed if we don’t provide them with an experience that closely approximates what the original experience of hearing these recordings was like. Going back to a point you made earlier about oversimplifying the place of these Vegas recordings in Elvis’ career, a lot of people will inevitably hear them as a bittersweet achievement, in light of what came afterward. My sense has always been that the arc of Elvis’ second career as a live performer matched that of his first run of success — in that Elvis got comfortable, and even lazy, far too quickly and easily. Is that fair? Ernst J: Well, I think that to a large extent it is exactly what you said. If you go to the people who knew him well in those years, one thing they said was that Elvis got easily bored, particularly with the repetition that was involved in both the movies and the live performances. You know, these days nobody in his right mind would go play two shows every single night, for four weeks in a row. During those years when Elvis would play in Vegas, there was no Monday break, or a Saturday when he wouldn’t play. There’s a lot of wear and tear in that situation as well, on the voice and on a body’s physical strength. I think what you see is that, with the Comeback Special and the Memphis sessions and the return to the concert stage, Elvis had achieved what he wanted to, and afterward there was a comedown. A lot of people had believed he wasn’t up to the challenge – and he was so nervous before the Comeback Special that it seemed he wasn’t sure he was up to it himself. That show, and the Memphis sessions as well, took him out of the comfort zone he had been establishing for years. 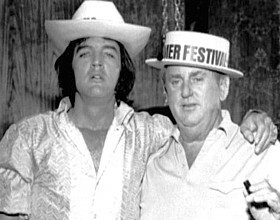 Even after the concerts we document on the new album, there were a few moments when the Colonel managed to create a situation that required Elvis’ very best – whether it was Madison Square Garden or Aloha from Hawaii – and Elvis really seemed to rise to those occasions. But apart from those moments, you can find a lot of places where things started to not go so well. He did get bored later. You mentioned Colonel Parker. For a long time it’s been fashionable to blame him for much of what went wrong in Elvis’ career. How do you see it? Ernst J: Clearly, he didn’t always … make great decisions. But as easy as it is to point to things the Colonel did or didn’t do, he was making decisions that he thought were serving the interests of his artist. Elvis had done a remarkable job of keeping focus between 1956 and ’58, considering the storm that was going on around him all the time. Toward the end of that period, King Creole was a phenomenal album, though Colonel Parker hated it — he thought it was too noisy and didn’t show off Elvis’ voice well enough. And the songs Elvis recorded right before he went into the army were an expansion on what he had been doing. They did a masterful job keeping Elvis’ music on the radio while he was gone, so you have to give the Colonel some credit there. In terms of Elvis’ return from the army, the Elvis is Back album was such a triumph. And there were great songs during that period, from "A Mess of Blues" and "Such a Night" and "Reconsider Baby" to "It’s Now or Never" and "Surrender." But then the Colonel abandoned the notion of doing studio albums, and it was years before Elvis did any extensive work in the studio that wasn’t related to soundtracks. Right before our interview I was flipping through your Complete Recording Sessions book (from 1998), and re-read the section about the album he made when he finally did go back in. Ernst J: Right! By 1966 Elvis was at a commercial low – his singles weren’t nearly as successful as they had been, and the soundtracks were selling fewer and fewer copies each time. He had been very intimidated by the British Invasion, and the songs from the soundtracks obviously weren’t competing very well with the music that was on the radio at that time. So you’d think when he went into a studio for the first time in three years, he would do something to compete with the Beatles and the Stones. But instead he came out with this amazing gospel album, How Great Thou Art – and he showed that he could still make great music on his own terms. Ernst J: Yeah, with Double Trouble, which might have been the very lowest point of that era. He was so unhappy to be recording "Old McDonald" that they couldn’t get him to show up to do his vocal. And then there was Easy Come, Easy Go, and he found himself singing a song called "Yoga Is as Yoga Does"! I’m interested in talking more generally about the repackaging of Elvis’ music through the years since his death. It’s been so many years now that a lot of people forget the slipshod reissues and repackages of the late ’70s and ’80s. And when you were tasked by RCA [around 1990] with overseeing Elvis’ catalog, was part of your mandate to undo some of the damage created during that era? Ernst J: It most certainly became that. There was a corporate-culture thing going on that was very interesting: In 1986 the Bertelsmann Group had bought RCA and Arista, and since at that time RCA was a company that was losing tens of millions of dollars per year, Bertelsmann decided to put European executives in charge. Those people came in with completely different ideas about how to do compilations and archival releases. RCA had been managing Elvis’ catalog for years based on some marketing research — which I’m sure had been done pretty well — that said the typical Elvis consumer was a woman between the ages of 35 and 55, who was married to a blue-collar worker, and who was unwilling to spend more than $8 on an Elvis album. This research was taken as gospel at the time I arrived. Ernst J: Right. So the first thing we created was the King of Rock and Roll box set, which featured the best mastering job we knew how to do at the time. It was radically different from what had been done before with Elvis’ catalog, it didn’t match the marketing research. Joe Galante was head of RCA at that time, and he had a lot of major fires to sort out. They had budgeted for 20,000 units of that box, and were surprised when initial orders reached 40,000. – Which led to more box sets of the later material, and the genre-specific collections that placed his music in a much more logical context than those slapdash Camden-label comps ever had. Ernst J: It’s interesting to sit here today and know that, for a lot of consumers that might want to buy Elvis’ music today, those box sets are long forgotten [and out of print!] 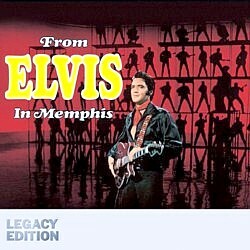 — as are original albums like From Elvis in Memphis, which was so important historically. That’s why we keep doing this work, to make sure that new generations of listeners get to experience the music in the best presentations we can create. 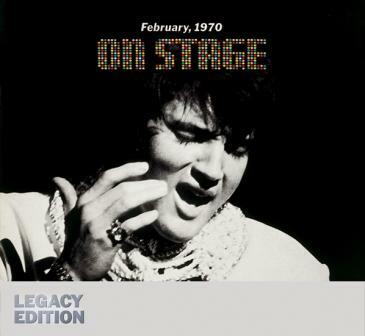 The On Stage reissue falls during the year long celebration of Elvis’ 75th. Are there more projects to come in this extravaganza? For example, will there be a soundtrack to the Cirque du Soleil show? Ernst J: I have an enormous respect for Cirque du Soleil, and at this point they’re obviously creating music specifically for the show that is spectacular. We haven’t discussed what kind of record might come out of it, so I don’t know. Is the show’s music anything like the mashups that were created for the Beatles show Love? Ernst J: Well, with Love they had George Martin in charge of reorganizing the music, which lent the whole project a lot of credibility. In this case, it’s the same sort of thing that happened with the JXL remix of "A Little Less Conversation" several years ago, which was an enormous success around the world. So what’s being done here is somewhat comparable to Love, in principle, though it’s very different. You sound … less than completely enthusiastic. Ernst J: To some extent I’m a puritan on this, but I have no problem getting excited about what they’re doing. It’s not part of my job description — I’m not paid to like it. My biggest concern is, you can see the show and hear the music in that context, but any album they create from it has to stand on its own. OK, one last question: When can we look forward to a Legacy reissue of Having Fun with Elvis on Stage? Ernst J: (much laughter) Hmmm… Let me punch this up on my computer … Ah! Here it is. It’s scheduled to come out precisely in the year 2499, and it will have extra tracks! We have outtakes of at least a dozen more ways that Elvis could cough, or ask for a drink of water. There are some choice swear words, too, but I’m not sure those should ever appear on a recording. If you’ve made it this far, Jorgensen’s perspective on Elvis’ legacy probably fascinates you as much as it clearly does me. For more, check out this exhaustive interview from 2002, conducted by Big-E fanatic Arjan Deelen. 'Ernst Jorgensen talks about Elvis Presley': Two very interesting interviews with Ernst Jorgensen from the TCM movie channel feature on YouTube. In Part 1 Ernst talks about his early discovery of Elvis as well as missing tapes & discovering Elvis' private gospel recordings. "To really appreciate music today, you need to know where it came from. That's a fascinating road." In Part 2 Ernst talks about rare discoveries from Elvis movies, Priscilla playing Ernst 'My Happiness' for the very first time and why Elvis is the most important of them all. "I don’t think we ever got to see Elvis as an actor in a proper setting." Click here for Part 2 - 10 minutes. Ernst Jorgensen & Roger Semon's 2002 discussion about the FTD label and their future releases. An EIN exclusive. Go here for the Ernst Jorgensen in-depth 2002 interview by Arjan Deelen EIN exclusive.